The local village is sick and tired of the goblins constantly causing them trouble. Click here to play! Milk gets stolen, cows get tipped over, the statue in the middle of town gets burned to the ground every Friday night... Oh wait, that's the teenagers. Nevertheless, the goblins have been kidnapping children and doing other such annoying things. Also, they stole the entire village coffer! It's not a lot of gold, but it's enough to be missed, you know? Well, apparently lots of other towns nearby have been having the same problems with the goblins. There may actually be a king's fortune in the goblin cave at this point, and we need a brave adventurer to get it back for us. Do you think you can do that? What? You're going to just take the Goblins Gold for yourself? You rascal! 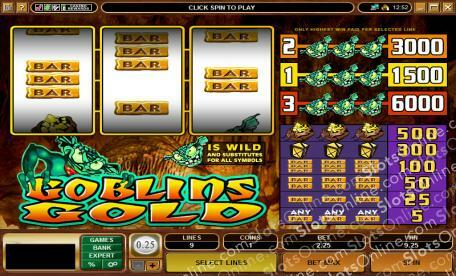 Play the Goblins Gold slots and rid the nearby villages of these pesky creatures before running off with all the cash! The Goblin Heads symbol is wild in this game, and it can substitute for all other symbols.